Most patients with psoriasis have chronic plaque psoriasis, the majority of whom can be managed in primary care. Emollients can reduce pruritus, plaque scale and restore skin pliability. Additional topical medicines include intermittent courses of topical corticosteroids, topical calcipotriol, or both in combination. Patients with psoriasis require life-long treatment and are at increased risk of cardiovascular disease, depression, inflammatory bowel disease and diabetes. This is the first article in a series of three on psoriasis. Guidance on selecting topical treatments and tailoring treatment to the affected body area is available in the second article: Choosing a topical treatment for patients with chronic plaque psoriasis. Guidance on monitoring patients with moderate to severe psoriasis is available in the third article: Monitoring patients with moderate to severe psoriasis. The Psoriasis Area and Severity Index (PASI) score is a method for assessing disease severity which takes into account affected area, erythema, thickness and scale on head and neck, upper limbs, trunk and lower limbs. The PASI score may be required if patients are referred to secondary care as it can help determine the urgency of referral and is also used for assessment of Special Authority eligibility for treatment with TNF inhibitors. Assessment of severity also requires consideration of functional impairment and the psychological impact of psoriasis. Patients can complete the ten question Cardiff Dermatology Life Quality Index (DLQI) to assess this: a result of < 10 indicates mild impact, 10–20 moderate impact and > 20 severe impact. A DLQI score may be requested when referring patients to secondary care. There is no cure for psoriasis and patients will typically have persistent disease throughout their lifetime. The aim of treatment is to improve the patient’s quality of life by reducing plaque size, scaling and thickness. 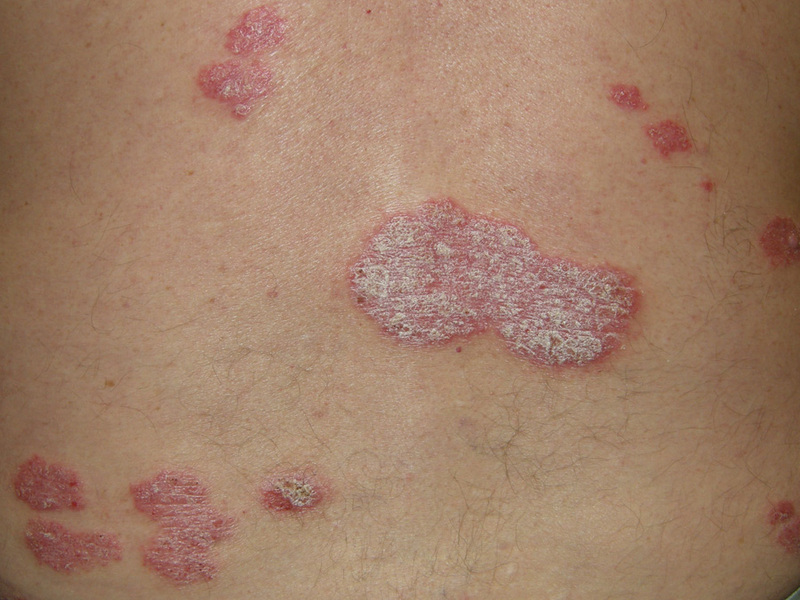 Some patients with mild psoriasis, however, may choose not to undergo treatment, as they consider it more troublesome than the condition, and some will have spontaneous resolution of plaques without treatment. *Clinicians may need to add instructions to apply liberally in prescribing software. Topical corticosteroids, topical calcipotriol and these medicines in combination provide additional benefit over and above the effect of emollients for patients with chronic plaque psoriasis.1 These topical medicines should be applied in sufficient quantities to cover symptomatic plaques. Second-line topical treatments for mild chronic plaque psoriasis include products containing coal or synthetic tar at concentrations of 0.5–12%, and keratolytics such as topical salicylic acid, used at concentrations of 2–5%. Emphasise appropriate durations for the use of topical corticosteroids and that patients should leave at least four weeks between courses of topical corticosteroids on the same area of skin; severe adverse effects are more likely when patients continue treatment beyond recommended timeframes or without appropriate intervals between courses. Lee M, Lamb S. Ethnicity of psoriasis patients: an Auckland perspective. N Z Med J 2014;127:73–4.